Earlier, Paul Barber explained about hand painting a kitchen coated in Danish oil. 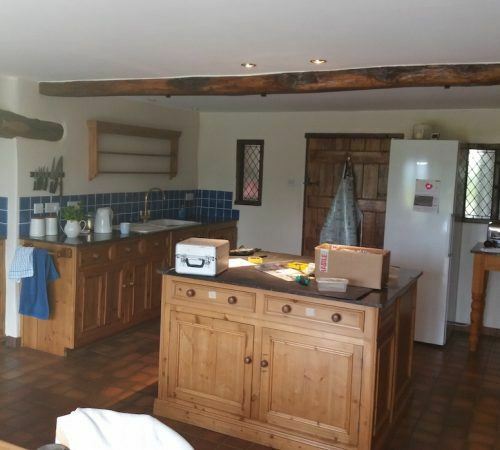 After 20 years of oiling, the kitchen in Northampton was a bit of a mess and the clients weren’t sure it could be salvaged. All’s well that ends well. 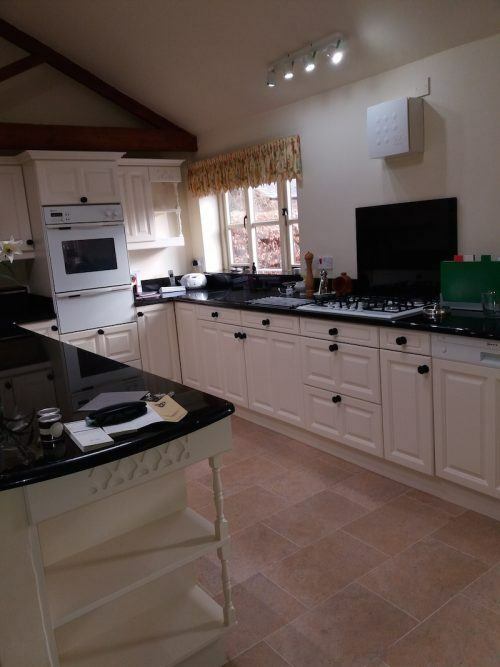 Here is a reminder of the result of Paul transforming that particular kitchen. 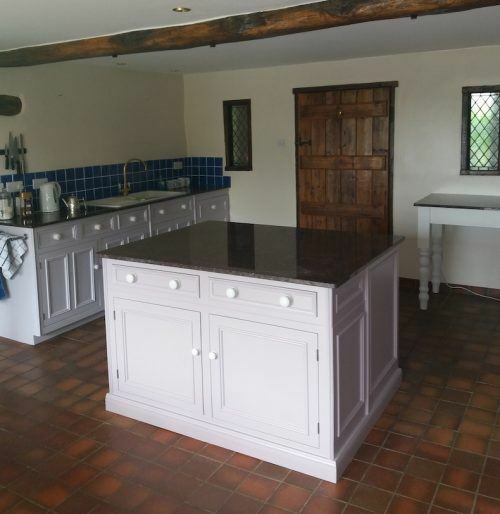 This hand made pine kitchen, again in Northampton, had been oiled with Danish oil, lots of it, over 29 years! As Paul explained, again the clients were not sure about the wisdom of hand painting a kitchen coated in Danish oil. But he knew what to do. This took a lot of deep cleaning with degreaser and meths before a complete sand down. I primed it with Zinsser BIN shellac primer to be on the safe side. Completed with Benjamin Moore Advance Satin waterborne topcoats. Everyone was delighted with another example of what is possible with a very dated but well made kitchen. Notice how the original tiles really pop now? 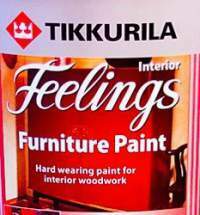 – No gunk left on the surface to interfere with paint drying or adhesion. – Any traces of old oil below will be held back in the wood preventing any potential staining. – The new paint system would have been touch dry the same day and been usable (carefully) within a couple of days. It would have fully cured after about 28 days. At that point the surface paint is at peak durability, and good for years of use. A lot of thought has gone into ways of leaving clients with the minimum of disruption. For Paul the answer is to remove the doors and drawer fronts and take them away to his workshop. With the frames fully exposed and accessible, he applies the full “prep and paint” treatment to everything left in situ. Paul then leaves the clients in peace to complete the bulk of the work in his workshop. He keeps everyone in the loop with progress, and returns to reinstall the kitchen, finish any loose ends, maybe change handles and leave the kitchen clean and ready for use. 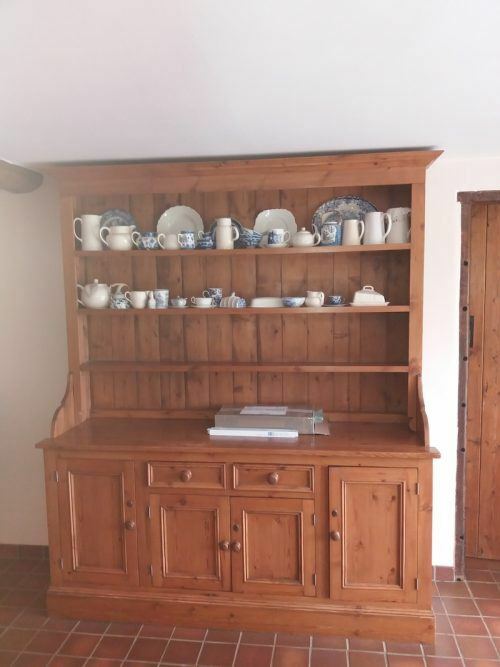 This kitchen was really well designed with plenty of character, including a Welsh dresser. 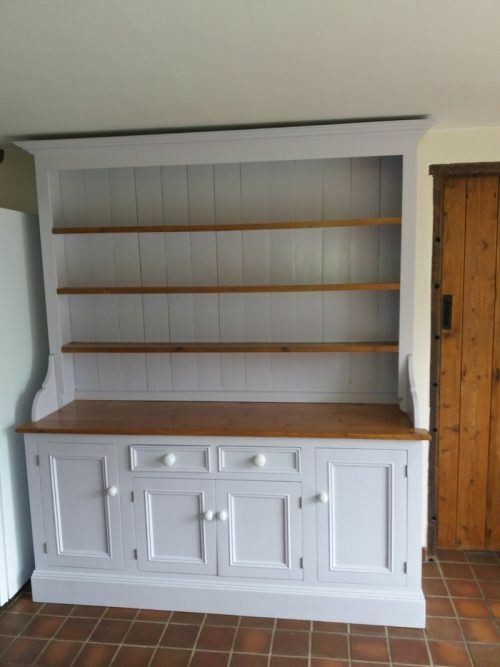 Paint and pine is a great combination for Welsh dressers. Shelving gets the most use, so a clear wood treatment works wonders. Lift the whole look and offset the shelving with a beautiful paint finish. Danish oil is a mix of linseed oil and tung oil. Oil penetrates a few millimetres at best into the wood and leaves a light coating in the surface grain. This super thin coating can be buffed up to create a protective surface. The grain of the natural timber shines through and water and food spills can be mopped up easily at the time. Oiling can become problematic when it is lathered on year on year and builds up a sticky surface coating. That is not so easy to keep clean. It is also not a fine starting point for over-painting. Neil Callender our Traditional Painter member in Wiltshire, swears by Tung oil. It is the closest to french polishing without the disadvantages! Here is a good run down of alternative clear wood treatments. It includes links to a discussion between the pros on wood care products. Paul covers Northampton, Beds and Bucks. 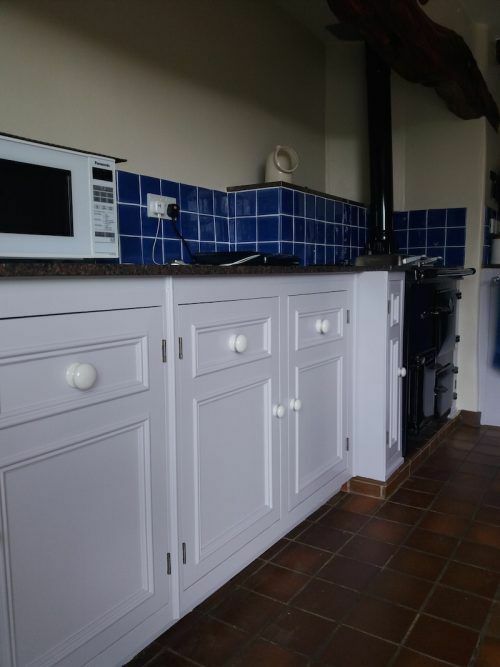 He has been kitchen painting since the early Smallbone days, and there is not much he hasn’t seen or solved. 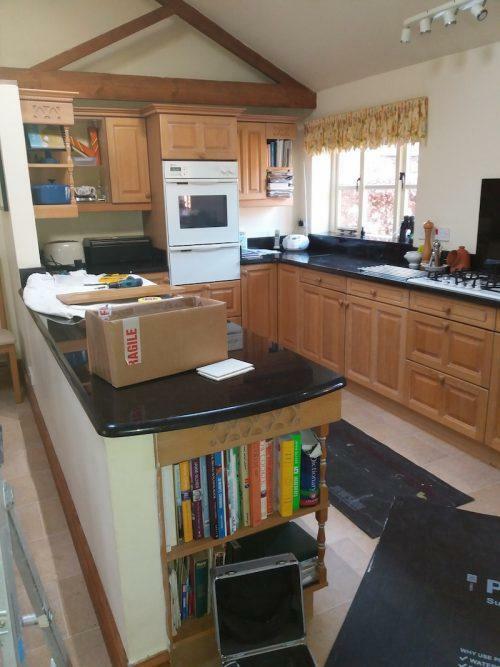 If you need advice on hand painting a kitchen coated in Danish oil, Paul is happy to explain how he would turn your old kitchen around with a durable painted finish. You can ask for a full no-obligation quote which he will provide free of charge. Traditional Painter members have at least a 3 month lead time, some at 6 months, so it is best to plan ahead. Wait 3 months, 6 months for a kitchen painter, you are kidding me? No. In the scheme of things, kitchen fitting or kitchen upgrades take a lot more planning than most homeowners might expect. 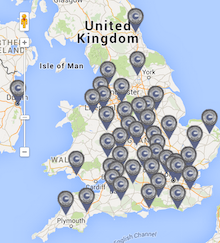 The minute you have designers, builders, installers, plumbers, tilers involved, schedules have a habit of expanding. So booking in a kitchen painter to turn up on time in a few months’ time is good planning, really! Time flies when you are having fun and making one of the best value upgrades possible to your home. When Paul turns up, having contacted you a month a week and a day before the agreed date, this video shows what you can expect. You can contact Paul direct on his site.